Impress a crowd with a decadent Tiramisu dessert and save time by creating the creamy treat with layered Sister Schubert's Homemade Rolls. In a bowl of an electric mixer, add egg yolks, egg and 1/4 cup sugar and beat on high speed until mixture becomes very thick and pale yellow, about 5 minutes. Add mascarpone and vanilla and mix on low speed until mixture is smooth. Transfer mixture to a large bowl. In a bowl, whip heavy cream and remaining 1 tablespoon sugar until thick. Fold whipped cream into egg mixture. To assemble dessert, dip half of roll pieces in espresso and place into an 8x8x2-inch baking dish. 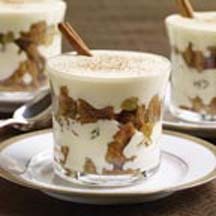 Sprinkle with half of raisins and cover with half of Mascarpone mixture and spread into an even layer. Repeat layering process and dust with cinnamon. Cover with plastic wrap and refrigerate for several hours or overnight. Serve chilled. Recipe and photograph provided courtesy of Sister Schubert® Homemade Rolls; through ECES, Inc., Electronic Color Editorial Services.